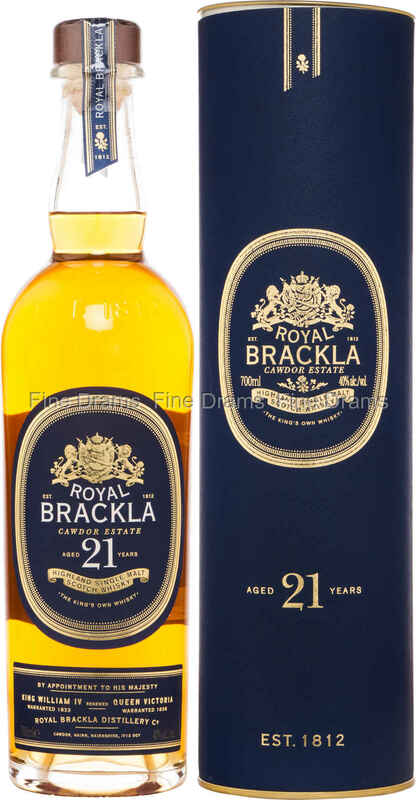 First launched in 2015 as part of Dewar’s Last Great Malt series, the 21 year old is an exciting addition to the Brackla range, one of the oldest standard releases from this distillery. Royal Brackla distillery is notable for a few reasons. It is one of only three distilleries to bear the “Royal” prefix, having been granted a Royal Warrant in 1833 by William IV. It is also known for its slow distillation, with tall stills that ensure plenty of reflux and an oily spirit. The distillery has long provided spirit for Dewar’s blends. This particular offering has been matured in former Oloroso sherry casks, which impart a delightful, dark dried fruit flavour and dense woodspice notes to this whisky. Some chocolate fudge and espresso appear, with a little vanilla custard. The mouthfeel is creamy and full, with the entire whisky a luxurious product. Presented in the traditional bottles of the Cawdor Estate distillery, this is certainly a whisky fit for a king.